Now that his stint as the Governor of California is long since in the rear-view mirror, Arnold Schwarzenegger is quickly becoming one of the busiest actors in Hollywood again. And his biggest upcoming project has to be, without a doubt, producer James Cameron (Avatar) and Deadpool director Tim Miller's direct sequel to Cameron's The Terminator and Terminator 2: Judgment Day. The movie doesn't currently have an official title, but Cameron says behind-the-scenes, everyone has been referring to it as Terminator: Dark Fate. 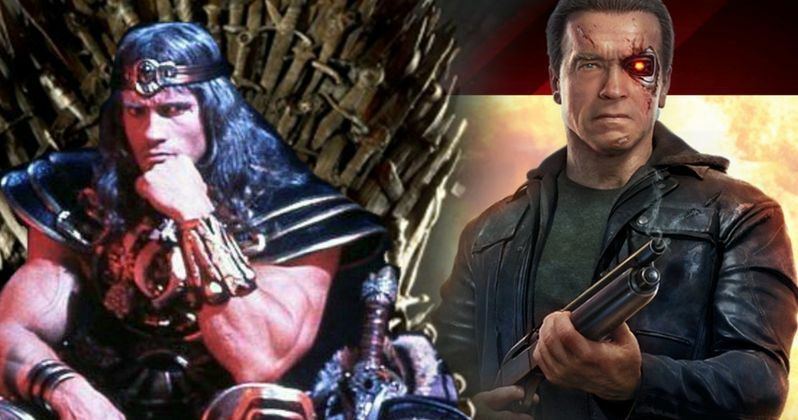 And Schwarzenegger recently sat down and chatted a bit about both this new Terminator and what he hopes to happen for a new The Legend of Conan motion picture. Schwarzenegger on working with Cameron and Miller on Terminator: Dark Fate. "It was a very interesting film to do with Tim, the dynamic, between him and with Jim Cameron producing. So Jim Cameron is right now directing Avatar films so he's taken on this enormous challenge and he's very busy with that BUT he's a control freak and as you know, Terminator is kind of his baby so he does get involved in the filming so there were interesting discussions about which direction to go with a certain scene or how the dialogue should finish or what the certain look should be of an individual and all that stuff so there was a big collaboration between Jim and Tim Miller. I feel it was in good hands with both of them." Arnold Schwarzenegger then went on to speak a bit about the Conan The Barbarian movie he still hopes to make, and just what the hell is gunking up the works. "The sad stuff about all of this is when there's an estate like this, The Robert E. Howard estate... when someone buys these rights, those people now own the rights and they have their own vision of what they want to do and the guy that has the rights is some young guy and he's trying to figure out how to get his way through Hollywood and this is not easy to do. So there are people that say to him, 'why don't you start with a TV series and then he negotiates for a TV series and that falls apart. And then he goes maybe to Netflix and that falls apart. Then he decides to make a movie maybe... but in the meantime, we have been trying to convince him for years now that the way to go is to come back and hire a really great director and to do another Conan movie and have me play King Conan, when Conan is like 70 years old and he's disgusted by sitting on the throne and being the king and then something happens after that. It's really not that far from creating a finished script. The only one who really has to pull the trigger there is the people who own the Conan rights to do a movie. Let's go to Netflix or whoever it is, let's hire a director who's very creative and can elevate the project to make it a winning project. I hope it will be done very soon because I think it's a great idea." Rest easy, Arnold as you are not alone in hoping to see yourself return as Conan in the near future. All of us share the same enthusiasm! Until we have further news on a new Conan movie, rest easy knowing Schwarzenegger will return alongside Linda Hamilton, Mackenzie Davis, Gabriel Luna, Natalia Reyes, and Diego Boneta in Terminator: Dark Fate come November 1, 2019. This interview with Schwarzenegger was originally conducted by The Arnold Fans.